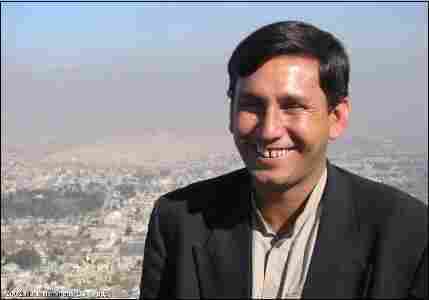 Welcome Home, Tahir: Afghan Escaped Taliban With 'Times' Reporter : The Two-Way Tahir escapes. Tahir Ludin, an Afghan interpreter and journalist whom I came to know very well in 2002 and 2003, tells a terrifying tale in The New York Times today about escaping from the Taliban with Times reporter David Rohde. The two men had been held for more than seven months in Taliban-controlled territory inside Pakistan. According to Tahir, he and Rohde planned the escape over many weeks. They were able to gather some information about the surrounding area, managed to hide away a piece of rope and — after wearing out some of the guards during a late-night board game — sneaked out by dropping down from a 20-foot high wall in the dead of night. In the darkness, a half-dozen guards who suspected they were suicide bombers aimed rifles at them and shouted for them to raise their hands and not move. "They said, 'If you move, we are going to shoot you,' " he (Tahir) said. Mr. Ludin said he was shivering in the darkness, and it took 15 minutes of anxious conversation to convince the guards that he had been kidnapped along with an American journalist — who hardly looked the part, with his long beard and Islamic attire. The men were eventually allowed in the compound, ordered to take off their shirts, searched, blindfolded and taken to the base's headquarters. After Pakistani officials confirmed their identities, they were treated well. Later that day, they were transferred to Islamabad, Pakistan's capital, and to an American military base outside Kabul. When I was reporting from Afghanistan for USA TODAY in 2002 and 2003, Tahir was my interpreter and guide during four of the six trips I made. He has, as the Times writes, an "exuberant personality." A man who loves to talk and debate, Tahir is a hard worker, a loyal colleague and a good friend to the foreign journalists he works with. We traded e-mails several times a year since my last trip to Afghanistan in 2003. But he didn't answer my last message to him, sent before I joined NPR in April. Now I understand why. Tahir, if you see this, welcome home! Drop me a line. Update at 10:20 a.m. ET, June 23: I just got off the phone with Tahir, who reports he's doing well. We couldn't speak for long, but he's due to talk with Morning Edition this week as well — so watch for more from that interview. I also hope to be able to hear more from him about what happened in coming weeks. According to Tahir, for their safety he and his family will be moving out of Afghanistan.